This article is about banana cultivars commonly used cooked. For true botanical plantains, see true plantains. Cooking bananas are banana cultivars in the genus Musa whose fruits are generally used in cooking. They may be eaten ripe or unripe and are generally starchy. Many cooking bananas are referred to as plantains (/ˈplæntɪn/ US: /plænˈteɪn/, UK: /ˈplɑːntɪn/) or green bananas, although not all of them are true plantains. Bananas are treated as a starchy fruit with a relatively neutral flavour and soft texture when cooked. Bananas fruit all year round, making them a reliable all-season staple food. The term "plantain" is loosely applied to any banana cultivar that is usually cooked before it is eaten. However, there is no botanical distinction between bananas and plantains. Cooking is also a matter of custom, rather than necessity, for many bananas. In fact, ripe plantains can be eaten raw since their starches are converted to sugars. In some countries, where only a few cultivars of banana are consumed, there may be a clear distinction between plantains and bananas. In other countries, where many cultivars are consumed, there is no distinction in the common names used. In botanical usage, the term "plantain" is used only for true plantains, while other starchy cultivars used for cooking are called "cooking bananas". All modern true plantains have three sets of chromosomes (i.e. they are triploid). Many are hybrids derived from the cross of two wild species, Musa acuminata and Musa balbisiana. The currently accepted scientific name for all such crosses is Musa × paradisiaca. Using Simmonds and Shepherds' 1955 genome-based nomenclature system, cultivars which are cooked often belong to the AAB Group, although some (e.g. the East African Highland bananas) belong to the AAA Group, and others (e.g. Saba bananas) belong to the ABB Group. Plantains contain more starch and less sugar than dessert bananas, therefore they are usually cooked or otherwise processed before being eaten. They are always cooked or fried when eaten green. At this stage, the pulp is hard and the peel often so stiff that it has to be cut with a knife to be removed. Mature, yellow plantains can be peeled like typical dessert bananas; the pulp is softer than in immature, green fruit and some of the starch has been converted to sugar. They can be eaten raw, but are not as flavourful as dessert bananas, so are usually cooked. When mature, yellow plantains are fried, they tend to caramelize, turning a golden-brown color. They can also be boiled, baked, microwaved or grilled over charcoal, either peeled or unpeeled. Plantains are a staple food in the tropical regions of the world, ranking as the tenth most important staple food in the world. As a staple, plantains are treated in much the same way as potatoes and with a similar neutral flavour and texture when the unripe fruit is cooked by steaming, boiling or frying. Since they fruit all year round, plantains are a reliable all-season staple food, particularly in developing countries with inadequate food storage, preservation and transportation technologies. In Africa, plantains and bananas provide more than 25 percent of the carbohydrate requirements for over 70 million people. Musa spp. do not stand high winds well, however, so plantain plantations are liable to destruction by hurricanes. An average plantain has about 220 calories and is a good source of potassium and dietary fiber. The sap from the fruit peel, as well as the entire plant, can stain clothing and hands, and can be very difficult to remove. Linnaeus originally classified bananas into two species based only on their uses as food: Musa paradisiaca for plantains and Musa sapientum for dessert bananas. Both are now known to be hybrids between the species Musa acuminata (A genome) and Musa balbisiana (B genome). The earlier published name, Musa × paradisiaca, is now used as the scientific name for all such hybrids. Most modern plantains are sterile triploids belonging to the AAB Group, sometimes known as the "Plantain group". Other economically important cooking banana groups include the East African Highland bananas (Mutika/Lujugira subgroup) of the AAA Group and the Pacific plantains (including the Popoulo, Maoli, and Iholena subgroups), also of the AAB Group. In countries in Central America and the Caribbean, the plantain is either simply fried, boiled or made into plantain soup. In Ghana, West Africa, boiled plantain is eaten with kontomire stew, cabbage stew or fante-fante (fish) stew. The boiled plantain can be mixed with groundnut paste, pepper, onion and palm oil to make eto, which is eaten with avocado. Ripe plantains can also be fried and eaten with black eyed beans cooked in palm oil – a popular breakfast dish. Kelewele, a Ghanaian snack, is spiced ripe plantain deep fried in palm oil or vegetable oil. In Nigeria, plantain is eaten boiled, fried or roasted; boli – roasted plantain – is usually eaten with palm oil or groundnut. In Guatemala, ripe plantains are eaten boiled, fried, or in a special combination where they are boiled, mashed and then stuffed with sweetened black beans. Afterwards, they are deep fried in sunflower or corn oil. The dish is called rellenitos de plátano and is served as a dessert. In Puerto Rico, the Dominican Republic, and Cuba, it can also be mashed after it has been fried and be made a mofongo, or fried and made into tostones, tajadas, or platanutres, or it can be boiled or stuffed. Tostones, also known as patacones are a popular staple in many South American countries. Plantains can be used for cooking at any stage of ripeness, but ripe ones can be eaten raw. As the plantain ripens, it becomes sweeter and its colour changes from green to yellow to black, just like bananas. Green plantains are firm and starchy, and resemble potatoes in flavour. Yellow plantains are softer and starchy yet sweet. Extremely ripe plantains have softer, deep yellow pulp that is much sweeter. Plantains in the yellow to black stages of ripeness can be used in sweet dishes. Steam-cooked plantains are considered a nutritious food for infants and the elderly. A ripe plantain is used as food for infants at weaning, mashed with a pinch of salt. Plantains are also dried and ground into flour; "banana meal" forms an important foodstuff. In southern India, dried plantain powder is mixed with a little bit of fennel seed powder and boiled in milk or water to make baby food to feed babies until they are one year old. In Peru, plantains are boiled and blended with water, spices, and sugar to make chapo. In Kerala, ripe plantains are boiled with sago, coconut milk, sugar and spices to make a pudding. After removing the skin, the unripe fruit can be sliced thin and deep fried in hot oil to produce chips. This thin preparation of plantain is known as tostones, patacones or plataninas in some of Central American and South American countries, platanutres in Puerto Rico, mariquitas or chicharritas in Cuba and chifles in Ecuador and Peru. In Cuba, the Dominican Republic, Guatemala, Puerto Rico and Venezuela, tostones instead refers to thicker twice-fried patties (see below). In Cuba, plantain chips are called mariquitas. They are sliced thinly, and fried in oil until golden colored. They are popular appetizers served with a main dish. In Colombia they are known as platanitos and are eaten with suero atollabuey as a snack. Tostada refers to a green, unripe plantain which has been cut into sections, fried, flattened, fried again, and salted. These tostadas are often served as a side dish or a snack. They are also known as tostones or patacones in many Latin American countries. In Honduras, banana chips are called tajadas, which may be sliced vertically to create a variation known as plantain strips. Chips fried in coconut oil and sprinkled with salt, called upperi or kaya varuthathu, are a snack in South India. They are an important item in sadya, a vegetarian feast prepared during festive occasions. The chips are typically labeled "plantain chips" when they are made of green plantains that taste starchy, like potato chips. In Tamil Nadu, a thin variety made from green plantains is used to make chips seasoned with salt, chili powder and asafoetida. In the western/central Indian language Marathi, the plantain is called rajeli kela (figuratively meaning "king-sized" banana), and is often used to make fried chips. Curries and soups using plantains are consumed throughout the world. Ripe plantains are used for making maduros (also named amarillos) in Latin American cuisine, in contrast to Tostones which are made with starchy unripe plantains. Alcapurria is a type of savory Puerto Rican fritter. 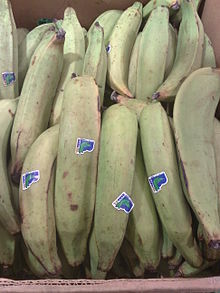 Although usually consisting mainly of grated green bananas and yautias, they can also contain plantains. The masa (dough) is used to encase a filling of ground meat (picadillo), and the alcapurrias are then deep-fried. "Little spiders" in Spanish translation, a Puerto Rican pattie fritter made from shredded unripe and ripe plantains mixed sometimes with herbs, spices and eggs. Sri Lanka's ash plantains called alu kesel are generally used for cooking. On some occasions, they are used in Ayurvedic medicine. Plantain flower also called as kesel mala (or kehelmala or kesel muwa). Plantain flower (or kehelmala or kesel muwa) is also used to make curries to be eaten with rice. In the Philippines, Banana cue is a popular snack. 'Banana cue' may be a misnomer as it is not cooked in a skewer over hot embers like a barbecue. Rather, the peeled flesh of an under-ripe plantain is fried in hot oil over medium fire before it is held in a skewer ready for sale. There are two ways to prepare a banana cue. One way is to fry the peeled banana in oil with some amount of brown sugar thrown in to caramelize the flesh. Another way is to fry the flesh in oil until done. When done, they are scooped out of the cooking pan and placed on a dripping pan to allow the oil to drip, before a generous amount of refined sugar is sprinkled over them. A variant from Mindanao, known as Ginanggang, is different in that it is actually grilled over charcoal. Philippine plantains (called Saba or Cardaba Bananas) are much smaller than the Latin American varieties, usually around 4–5 inches and somewhat boxy in shape. They are eaten mostly in their ripe stage as a dessert or sweet snack, often simply boiled, in syrup, or sliced lengthwise and fried, then sprinkled with sugar. They are also quite popular in this fried form (without the sugar) in the local version of the Spanish dish, Arroz a la Cubana, consisting of minced picadillo-style seasoned beef, white rice, and fried eggs, with fried plantains on the side. In addition, there is the equally popular merienda snack, Turrón, where ripe plantains, as well as jackfruit in some variants, are sliced and then wrapped in lumpia wrapper (a thin rice paper) and deep-fried. Turron is then finished off with a brown sugar glaze. The traditional South American style large plantains (grown in the Southern Philippines) are now increasingly available in local Filipino markets. Boli is the term used for roasted plantain in Nigeria. The plantain is usually grilled and served with roasted fish, ground peanuts and a hot palm oil sauce. It is very popular as a lunch snack in southern and western Nigeria, for example in Rivers State, Bayelsa State, Cross River State, Delta State, Edo State and Lagos State. It is popular among the working class as a quick midday meal. Plantain dumplings from Puerto Rico are grated and mixed with cornstarch, egg, seasoning, parsley, and annatto oil. They are then formed into a ball about the size of a golf ball. The balls are first deep fried and then dropped into a hot broth usually a soup with pigeon peas and ham called asopao. Cayeye, also called Mote de Guineo, is a traditional Colombian dish from the Caribbean Coast of the country. Cayeye is made by cooking small green bananas or plantains in water, then mashing and mixing them with refrito, made with onions, garlic, red bell pepper, tomato and achiote. Cayeye are usually served for breakfast with fresh grated Colombian cheese (Queso Costeño) and fried fish, shrimp, crab, or beef. Most popular is Cayeye with fresh cheese, avocado and fried egg on top. Chifles is the Spanish term used in Peru and Ecuador for fried green plantains sliced (1 or 2 mm thick); it is also used to describe plantain chips which are sliced thinner. A road side stall in Ouagadougou, Burkina Faso selling Dodo. Plantain is popular in West Africa, especially Cameroon, Bénin, Ghana and Nigeria; when ripe plantain is fried, it is generally called dodo (dough – dough). The ripe plantain is usually sliced diagonally for a large oval shape, then fried in oil to a golden brown color. This can be eaten as such, with stew or served with beans or on rice. In Ikire, a town in Western Nigeria precisely Osun State, there is a special and unique way of preparing plantain chips. This is popularly called Dodo Ikire. Dodo Ikire is made from overripe plantain, chopped in small pieces, sprinkled with chili pepper and fried in boiling point palm oil. After frying it turns blackish. The fried plantain chips are then stuffed carefully into a special conically shaped woven basket of about 10 centimeters high. This special dodo can have a preservative quality that lasts up to two months without refrigeration. Pazham pori – a plantain dish from south India. Ethakka appam, pazham (banana) boli or pazham pori are terms used for fried plantain in Kerala. The plantain is usually dipped in sweetened rice and white flour batter and then fried in coconut or vegetable oil. It is a very popular snack among Keralites. This is very similar to pisang goreng (Indonesian for fried bananas), which is a dessert common to Malaysia, Indonesia and Singapore. It is also known as Bajji in Tamil Nadu. Eto a popular Ghanaian traditional dish. It is mainly made from boiled and mashed yam or plaintain. For the plaintain option called ‘Boodie eto’, the plantain can be used unripe, slightly ripe or fully ripe. Culturally, it was the food fed to a bride on the day of her marriage and its best savored with a whole egg, groundnut (peanuts) and sliced avocado. Fufu de platano is a traditional and very popular lunch dish in Cuba, and essentially akin to the Puerto Rican mofongo. It is a fufu made by boiling the plantains in water and mashing with a fork. The fufu is then mixed with chicken stock and sofrito, a sauce made from lard, garlic, onions, pepper, tomato sauce, a touch of vinegar and cumin. The texture of Cuban fufu is similar to the mofongo consumed in Puerto Rico, but it is not formed into a ball or fried. Fufu is also a common centuries-old traditional dish made in Côte d'Ivoire, Ghana, Nigeria, Cameroon and other West & Central African countries. It is made in a similar fashion as the Cuban fufu, but is pounded, and has a thick paste, putty-like texture which is then formed into a ball. West African fufu is sometimes separately made with cassava, yams or made with plantains combined with cassava. In Ecuador, plantain is boiled, crushed, scrambled, and fried into majado. This dish is typically served with a cup of coffee and bistek, fish, or grated cheese. It is a popular breakfast dish. Majado is also used as a base to prepare tigrillo and bolones. To prepare trigrillo, majado is scrambled with pork rind, egg, cheese, green onions, parsley, and cilantro. To prepare bolones, majado is scrambled with cheese, pork rind, or a mixture of both. The resulting mixture is then shaped into a sphere which is later deep-fried. Both tigrillo and bolones are typically served with a cup of coffee. A traditional mangú from the Dominican Republic consists of peeled green, boiled plantains, mashed with enough hot water they were boiled in so the consistency is a little stiffer than mashed potatoes. It is traditionally eaten for breakfast, topped with sautéed onions and accompanied by fried eggs, fried cheese, fried salami, or avocado. Matooke, or matoke, is a cooking banana dish of the Baganda, now widely prepared in Uganda, Tanzania, Rwanda and eastern Congo. The cooking bananas (specifically East African Highland bananas) are peeled, wrapped in the plant's leaves and set in a cooking pot (a sufuria) on the stalks that have been removed from the leaves. The pot is then placed on a charcoal fire and the matoke is steamed for a few hours. While uncooked, the matoke is white and fairly hard, but cooking turns it soft and yellow. The matoke is then mashed while still wrapped in the leaves, and often is served on a fresh leaf and eaten with a sauce made of vegetables, ground peanuts, or some type of meat (goat meat and beef are common). Mofongo, a Puerto Rican dish made from fried green plantains. Originating from Puerto Rico, and essentially akin to the Cuban fufu, mofongo is made by mashing fried plantains in a mortar with chicharrón or bacon, garlic, olive oil and stock. Any meat, fish, shellfish, vegetables, spices, or herbs can also be added. The resulting mixture is formed into cylinders the size of about two fists and eaten warm, usually with chicken broth. Mofongo relleno is topped with creole sauce rather than served with chicken broth. Creole sauce may contain stewed beef, chicken or seafood; it is poured into a center crater, formed with the serving spoon, in the mofongo. Nagasari is a traditional steamed kue (Indonesian traditional cake) made from rice flour, coconut milk and sugar, filled with slices of banana. It is usually wrapped in banana leaves before being steamed, or prepared with pandan that gives it aroma. It is commonly eaten as a snack in Indonesia where it is also known as kue bandang-bandang by Bugis people. Sometimes it is simply called kue pisang (banana cake). Piñon is a traditional dish from Puerto Rico. The dish is similar to lasagna, but uses sweet plantains (amarillitos) to replace the pasta layers. A similar dish called pastelon is made with layers of mashed plantains. A popular Caribbean dish which originated in Puerto Rico is called piononos, after Pope Pius IX, and is made of sweet plantain forming a ring stuffed with seasoned meat or seafood, with an egg-and-flour mixture covering both open sides of the ring and deep-fried. Pisang goreng ("fried banana" in Indonesian and Malay) is a plantain snack deep-fried in coconut oil. Pisang goreng can be coated in batter flour or fried without batter. It is a snack food mostly found in Indonesia, Malaysia, Singapore and Brunei. After removing the skin, the ripened fruit (maduro) can be sliced (between 3 mm and 2 cm thick) and pan-fried in oil until golden brown or according to preference. In the Dominican Republic, Ecuador, Colombia, Honduras (where they are usually eaten with the native sour cream) and Venezuela, they are also eaten baked in the oven (sometimes with cinnamon). 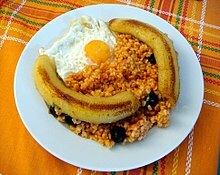 In Puerto Rico baked plátanos maduros are usually eaten for breakfast and served with eggs (mainly an omelet with cheese), chorizo or bacon. Only salt is added to green plantains. Plátanos maduros are commonly eaten in the Dominican Republic, Haiti, El Salvador, Guatemala, Ecuador, Honduras, Panama, Peru, Colombia, Cuba, Suriname, Nicaragua, Puerto Rico, Jamaica, Trinidad and Tobago and most of the English-speaking Caribbean (called plantain), Aruba, Nicaragua and Venezuela. In Costa Rica, they are sprinkled with sugar. In western Nigeria, fried, sliced plantains are known as dodo, and in Cameroon, they are known as missole. In Venezuela, the ripe fruit is cut lengthwise, 3–4 mm thick, and fried until golden and sticky to make tajadas, a common side dish; they are an integral piece of the national dish, pabellon criollo. In Honduras, Venezuela and Central Colombia, fried ripened plantain slices are known as tajadas. They are customary in most typical meals, such as the Venezuelan pabellón criollo. The host or waiter may also offer them as barandas (guard rails), in common slang, as the long slices are typically placed on the sides of a full dish, and therefore look as such. Some variations include adding honey or sugar and frying the slices in butter, to obtain a golden caramel; the result has a sweeter taste and a characteristic pleasant smell. The same slices are known as amarillos and fritos maduros in Puerto Rico and the Dominican Republic respectively. In Honduras, they are a popular takeaway food, usually with fried chicken, though they are also regularly eaten at home. They are popular chips sold in pulperias (minimarkets). In Panama, tajadas are eaten daily together with steamed rice, meat and beans, thus making up an essential part of the Panamanian diet, as with Honduras. By contrast, in Nicaragua, tajadas are fried unripened plantain slices, and are traditionally served in a fritanga or with fried pork, or on their own on green banana leaves, either with a cabbage salad or fresh cheese. On Colombia's Caribbean coast, tajadas of fried green plantain are consumed along with grilled meats, and are the dietary equivalent of the French-fried potatoes/chips of Europe and North America. Tostones being fried for the second time. Tostones (also known as banann peze in Haiti, tachinos or chatinos in Cuba, platanos verdes fritos or fritos verdes in the Dominican Republic and patacones in Colombia, Costa Rica, Ecuador, Honduras, Panama, Peru and Venezuela) are twice-fried plantain patties, often served as a side dish, appetizer, or snack. Plantains are sliced in 4 cm (1.6 in) long pieces and fried in oil. The segments are then removed and individually smashed down either with the bottom of a bottle or with a tostonera, to about half their original height. Finally, the pieces are fried again and then seasoned, often with salt. In some countries, such as Haiti, Cuba, Puerto Rico and the Dominican Republic, the tostones are dipped in creole sauce from chicken, pork, beef, or shrimp before eating. In Nicaragua, tostones are typically served with fried cheese (Tostones con queso) and sometimes with refried beans. In some South American countries, the name tostones is used to describe this food when prepared at home and also plantain chips (mentioned above), which are typically purchased from a store. In western Venezuela, much of Colombia and the Peruvian Amazon, patacones are a frequently seen variation of tostones. Plantains are sliced in long pieces and fried in oil, then used to make sandwiches with pork, beef, chicken, vegetables and ketchup. They can be made with unripe patacon verde or ripe patacon amarillo plantains. Tostones in the Dominican Republic are only fried once and are thicker than chips. Although there are local names for tostones in almost every Latin country, they are still commonly called tostones in all of Latin America. Tacacho is a roasted plantain Amazonian cuisine dish from Peru. It is usually served con cecina, with bits of pork. In Venezuela, a yo-yo is a traditional dish made of two short slices of fried ripened plantain (see Tajadas) placed on top of each other, with local soft white cheese in the middle (in a sandwich-like fashion) and held together with toothpicks. The arrangement is dipped in beaten eggs and fried again until the cheese melts and the yo-yo acquires a deep golden hue. They are served as sides or entrees. Plantain leaves are used as plates in some tropical regions. Each pseudostem of a plantain plant will flower only once, and all the flowers grow at the end of its shoot in a large bunch consisting of multiple hands with individual fingers (the fruits). Only the first few hands will become fruits. In the Philippines, the plantain inflorescence (particularly those from saba bananas), locally known as puso ng saging (banana hearts) are eaten. In Vietnam, the young male flower, at the end of the bunch, is used in salads. In the cuisine of Laos, the plantain flower is typically eaten raw in vermicelli soups. A type of poriyal, or peretal (dry curry), is made from plantain flowers in Andhra Pradesh and Tamil Nadu. Thoran is made in Kerala with the end of the bunch (called koompu in Malayalam) and is considered highly nutritious. In Karnataka, the inflorescence is used to make sweet and sour gojju, a gravy dish. Plantain leaves can exceed two meters in length. They are similar to banana leaves, but are larger and stronger, thus reducing waste in cooking. In Latin America, plantain leaves are lightly smoked over an open fire, which makes them more flexible, and improves storage properties, flavor and aroma. In Venezuela, they are available in grocery stores or open-air markets and are used as wrappers in hallacas. In Nicaragua, they wrap nacatamales, as well as vigoron, vaho and other dishes. In Mexico, Guatemala, Peru, El Salvador, Honduras, Costa Rica, Panama, and Colombia, plantain leaves are usually used to wrap tamales before and while cooking, and they can be used to wrap any kind of seasoned meat while cooking to keep the flavor in. Puerto Rican pasteles are made primarily with fresh green banana dough stuffed with pork, and then wrapped in plantain leaves which have been softened by smoking. Many rice dishes in Puerto Rico are cooked with plantain leaves as a lid to add flavor and aroma. In Puerto Rico fish and pork shoulder can be wrapped in plantain leaves and baked. Guanimes, known as Puerto Rican tamales, which are made of cornmeal cooked with coconut milk and other ingredients, are wrapped in plantain leaves. Similarly, in Africa, plantain leaves are dried and used to wrap corn dough before it is boiled to make fanti kenkey, a Ghanaian dish eaten with ground pepper, onions, tomatoes and fish. In Nigeria, ground beans mixed with onions, fish and boiled egg is wrapped in plantain leaves and boiled to make bean cakes called moin-moin or moi-moi. Traditionally, plantain leaves are used like plates while serving South Indian thali or during sadya. A traditional southern Indian meal is served on a plantain leaf with the positions of the different kinds of food items on the leaf having significance. The leaves also have a religious significance in many Hindu rituals. They add a subtle, but essential, aroma to cooked dishes. In the Indian state of Kerala, a food preparation called ada is made in plantain leaves. Plantain leaves are also used in making karimeen pollichathu in Kerala. In the South Indian states of Kerala, Karnataka, Andhra Pradesh and Tamil Nadu, plantain leaves are used to serve food during festivals or special occasions. People use the leaves like cooking foil for steaming idlis (steamed rice cakes) and kozhukkatais (steamed rice dumplings). The leaves are also widely used as a packaging material for packing food and flowers, although plastics are beginning to replace the leaves for this purpose. The leaves are similarly used to wrap certain kinds of food in the Philippines as well. After harvesting the fruit, the plantain plant can be cut and the layers peeled like an onion to get a cylinder-shaped soft shoot. In the South Indian states of Kerala and Tamil Nadu, plantain shoot is chopped into fine pieces and used in salads, dry curry (often seasoned with coconut and green chillies), or wet curry (with yogurt, red chillies and coconut). Plantain shoot is considered rich in fibre, and is considered a very good remedy for avoiding constipation. Regular intake of the juice squeezed from the shoot or of the shoot consumed as a salad is locally considered a cure for various ailments such as stomach ulcers and kidney stones. This can be chopped and first steamed, then fried with masala powder, to make a special dish. This dish is called posola in Assamese and a distinct part of Assamese cuisine. In Kerala and Andhra Pradesh, a thoran is made from the shoot for auspicious occasions like marriages. The peeled layers are used by farmers as a binding rope for packaging agricultural produce, such as flowers, betel leaves, etc. The dried stem peels are slit into fine threads and are used for weaving mats, stringing garlands and wrapping packages. Juice from the stem and the peel have also been used traditionally in first aid for burns and minor abrasions. Vazhaithandu is a Tamil word for the stem and it is used in various soups, stews, stir-fries, and koottus. Plantain is 32% carbohydrates with 2% dietary fiber and 15% sugars, 1% protein, 0.4% fat, and 65% water, supplying 122 calories in a 100-gram serving (table). Raw plantain is an excellent source (20% or higher of the Daily Value, DV) of vitamin B6 (23% DV) and vitamin C (22% DV), and a good source (10-19% DV) of magnesium and potassium (table). Containing little beta-carotene (457 micrograms per 100 grams), plantain is not a good source of vitamin A (table). The following table shows the nutrient content of raw plantain and major staple foods. Plantain and banana allergies occur with typical characteristics of food allergy or latex fruit syndrome, including itching and mild swelling of the lips, tongue, palate or throat, skin rash, stomach complaints or anaphylactic shock. Among more than 1000 proteins identified in Musa species were numerous previously described protein allergens. ^ Luis A. Bello-Perez; Edith Agama-Acevedo; Olivier Gilbert; Domonique Dufour (2012). "Banana". In Muhammad Siddiq (ed.). Tropical and Subtropical Fruits: Postharvest Physiology, Processing and Packaging. Wiley-Blackwell. p. 149. ISBN 9781118324110. ^ Alan Davidson (2014). Tom Jaine (ed.). The Oxford Companion to Food. Oxford Companions Series (3rd ed.). Oxford University Press. p. 58. ISBN 9780199677337. ^ Jennifer Thomson (2014). "Africa". In Stuart J. Smyth; Peter W.B. Phillips; David Castle (eds.). Handbook on Agriculture, Biotechnology and Development. Edward Elgar Publishing. p. 107. ISBN 9780857938350. ^ a b Wells, John (2000). Longman Pronunciation Dictionary. ISBN 978-0-582-36467-7. ^ * "Plantain". Oxford Dictionaries Online. Oxford University Press. April 2010. Retrieved 17 September 2010. "Plantains: John Well's phonetic blog". 17 September 2010. ^ "Musa species (banana and plantain)" (PDF). ^ J. Redhead (1989). M. Boelen (ed.). Utilization of Tropical Foods: Trees. FAO Food and Nutrition Paper. Food and Agriculture Organization of the United Nations. p. 32. ISBN 9789251027769. ^ S.S. Cronauer; A.D. Krikorian (2012). "Banana (Musa spp.)". In Y.P.S. Bajaj (ed.). Trees I. Biotechnology in Agriculture and Forestry. Springer Science & Business Media. p. 233. ISBN 9783642705762. ^ R.V. Valmayor; S.H. Jamaluddin; B. Silayoi; S. Kusumo; L.D. Danh; O.C. Pascua; R.R.C. Espino (2000). "Banana Cultivar Names and Synonyms in Southeast Asia". In A.B. Molina; V.N. Roa (eds.). Advancing Banana and Plantain R&D in Asia and the Pacific. Bioversity International. p. 55. ISBN 9789719175131. ^ Thi-Thanh-Tam Vu (2005). Modes of Action of Non-pathogenic Fusarium oxysporum Endophytes for Bio-enhancement of Banana Toward Radopholus similis. Cuvillier Verlag. p. 1. ISBN 9783865374752. ^ "Musa paradisiaca". Retrieved 29 August 2015. ^ Mary Taylor (2003). "Status of Banana R&D in the Pacific". In A.B. Molina; V.N. Roa; I. Van der Bergh; M.A.G. Maghuyop; K. Borromeo (eds.). Advancing banana and plantain R & D in Asia and the Pacific Vol. 12: Proceedings of the 2nd BAPNET Steering Committee Meeting held in Jakarta, Indonesia, 6-11 October 2003. Bioversity International. p. 129. ^ Paul Turnbull (5 May 2004). "Plantains". South Seas Companion. Retrieved 18 November 2016. ^ UNCST (July 2007). "THE BIOLOGY OF BANANAS AND PLANTAINS" (PDF). Uganda National Council for Science and Technology in collaboration with PBS – a US Agency for International Development (USAID). Archived from the original (PDF) on 16 December 2011. ^ "Plantains". Retrieved 25 August 2009. ^ Randy C. Ploetz; Angela Kay Kepler; Jeff Daniells; Scot C. Nelson (2007). "Banana and plantain – an overview with emphasis on the Pacific island cultivars" (PDF). Species Profiles for Pacific Island Agroforestry. Retrieved 5 June 2011. ^ Pereira, Ignatius (13 April 2013). "The taste of Kerala". The Hindu. Chennai, India. Retrieved 3 January 2014. ^ "Aloco recipe". Aloco. congocookbook.com. Archived from the original on 18 July 2006. Retrieved 12 August 2006. ^ Sitanala, J. E; Sitanggang, Hilderia; (Indonesia), Proyek Inventarisasi dan Dokumentasi Kebudayaan Daerah (1983). Isi dan kelengkapan rumah tangga tradisional menurut tujuan, fungsi dan ... - J. E. Sitanala, Hilderia Sitanggang, Proyek Inventarisasi dan Dokumentasi Kebudayaan Daerah (Indonesia) - Google Books. Retrieved 29 August 2015. ^ Sidek, Noraini (2004). Sajian keraian, perancangan, penyediaan & resipi. ISBN 9789676115072. Retrieved 29 August 2015. ^ "resepi kuih". Retrieved 29 August 2015. ^ "Kue Nagasari". Kue Nusantara. 3 December 2010. Retrieved 6 June 2012. ^ Tay, Leslie. "Million Stars Goreng Pisang". ieatishootipost.sg. Wikimedia Commons has media related to Plantains.